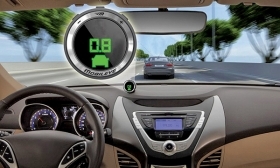 Mobileye says its technology already is in more than 6 million vehicles. JERUSALEM (Bloomberg) -- Ziv Aviram regularly drives part of the 42-mile stretch to Tel Aviv from Jerusalem with no hands. Gliding through traffic along Highway 1, the car slows and accelerates independently as Aviram focuses on his iPhone. The on-board chips and software that allow the CEO of Mobileye NV to check e-mail and read news while his Audi A7 cruises at highway speeds will reach consumers for the first time this year, he said, declining to identify the automaker. Three more manufacturers will introduce the features in the next two years, and nine others are preparing to follow, he said. Google is taking a more revolutionary approach. Since 2009, its fleet of self-driving vehicles has roamed the streets of Mountain View, Calif. This month, two began cruising in Austin, Texas. The cars have covered more than 1 million miles, according to Google’s website, and may be available to consumers as early as 2019. Unlike Mobileye’s technologies, which interpret visual data much as a human would, Google’s cars navigate largely by relying on vast amounts of stored data about the streets, according to a presentation that Mobileye co-founder Amnon Shashua gave at the 2015 Deutsche Bank Global Auto Industry Conference. Aviram said he doesn’t see Google’s more expensive prototype as a practical rival. Mobileye is already making money with systems that lay the stepping stones toward a driverless future. The company’s revenue -- derived mostly from driver-assistance technology -- is forecast to grow 53 percent this year to $220 million, according to the average estimate of 11 analysts surveyed by Bloomberg. Seven years from now, the majority of Mobileye’s revenue will come from semi-autonomous and autonomous cars, Aviram says. Google spokeswoman Courtney Hohne declined to comment on comparisons between driverless-car initiatives. Mobileye’s assisted-driving technology applies algorithms to video images taken from a single camera to detect nearby vehicles, pedestrians, traffic lights or lane departures. It warns drivers of potential hazards or applies autonomous braking, and has led to the development of chips and systems that will be used in fully autonomous vehicles. Aviram says automakers will be able to produce a driverless car as soon as 2021, with Mobileye technology and other sensors costing $1,000 or less, according to the company. The company’s $1 billion IPO in July 2014 was the biggest on record for an Israeli company in the U.S. The stock has more than doubled since then and closed at a record $58.99 on July 14, giving Mobileye a market capitalization of $13 billion. That’s made billionaires of Aviram, Shashua and Shmuel Harlap, the company’s largest shareholder, according to the Bloomberg Billionaires Index. Today, each founder controls a 5 percent stake of the company’s shares valued at about $675 million, according to stock exchange filings. Together, they own options with a net value of more than $800 million and have sold $300 million worth of shares, according to data compiled by Bloomberg. Yonah Lloyd, a spokesman for Mobileye, declined to comment on the net worth of Aviram and Shashua. Harlap confirmed he was a billionaire. Shashua, 55, a computer vision specialist, and Aviram, 56, a former CEO of Israeli retail chains Keter and Gali, founded Mobileye in 1999. They were introduced to each other by their wives, who were childhood friends, Aviram said. Harlap, who controls Colmobil Ltd., Israel’s biggest car distributor, first invested in 2001 after Shashua and Aviram gave a presentation to him and other local car dealers. He said his early investments in Mobileye, totaling “a few million dollars,” felt like a lot of money at the time. His 7 percent stake is now valued at about $900 million. Including his controlling stake in Colmobil, the exclusive distributor of Mitsubishi, Hyundai and Mercedes-Benz in Israel, the 70-year-old’s fortune is valued at $1.3 billion, according to the index. Mobileye’s growth has been fueled by regulations that encourage advanced safety features. In May, the U.S. National Transportation Safety Board published a report calling for collision-avoidance technology to be a standard feature in all new passenger and commercial vehicles. At the same time automakers are racing to recast their business models and develop self-driving cars. Vehicles that move in harmony with one another may be essential to safely move people and goods efficiently through the world’s expanding megacities. Mobileye already works with about 90 percent of car manufacturers on driver assistance systems, according to the company. That positioning gives the company “deep defensive moats” around the business that could help protect its market share and its margins for more than a decade, according to a May 12 report from Morgan Stanley research analyst Ravi Shanker. Self-driving technology is an even more enticing opportunity because it requires more complex features that cost three-times as much as the advanced driver assistance systems that Mobileye sells now, Aviram said. The biggest hurdle, he said, is the liability automakers may have to assume in putting the cars on the road. That’s why Mobileye is choosing to phase in its semi-autonomous driving system in three parts over the next six years: highways, country roads, and then city streets.